Dress up marshmallow Peeps hearts with holiday sprinkles and chocolate! 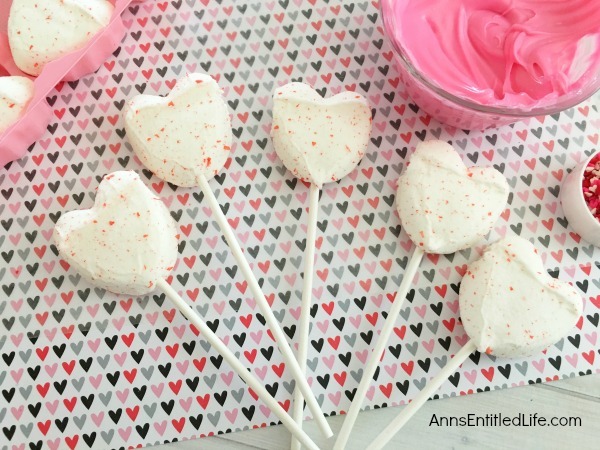 These simple to make Peeps pops will be a big hit with friends and family this Valentine’s Day. 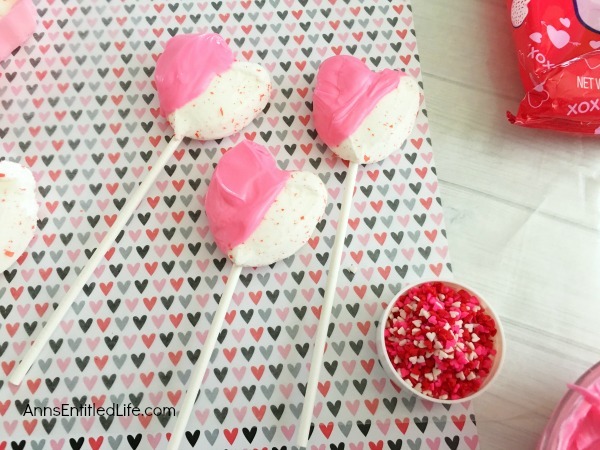 If you are looking for a simple to make Valentine Day candy treat, this is it. • Place a lollipop stick into the bottom of each heart and push almost all the way up to the top of the heart; set aside. • In a small microwave safe bowl, melt one cup of bright pink candy melts on 50% power for 3-4 minutes, stirring every 30 seconds until completely melted and smooth. 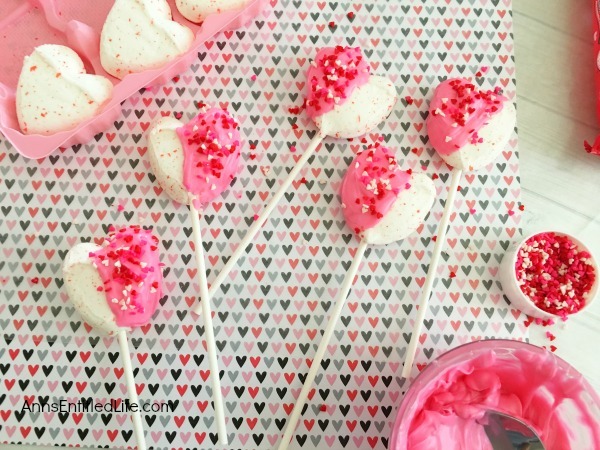 • Dip one side of a marshmallow peep (on the stick) into the melted pink chocolate. Place onto the prepared cookie sheet. 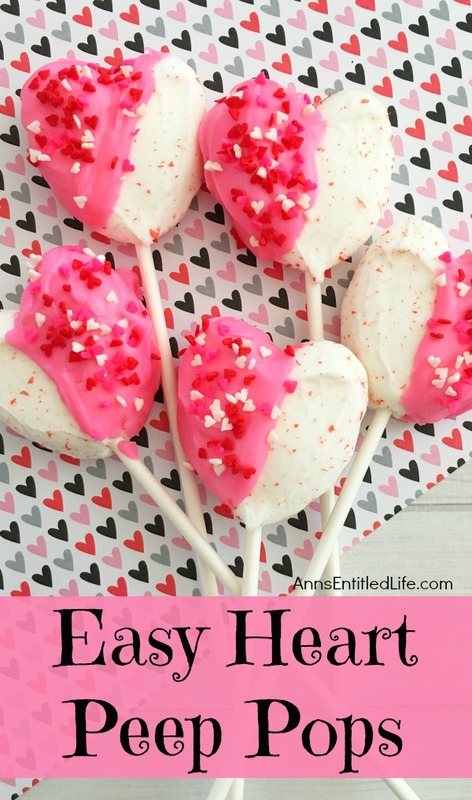 • Immediately top the chocolate coated heart with heart sprinkles. 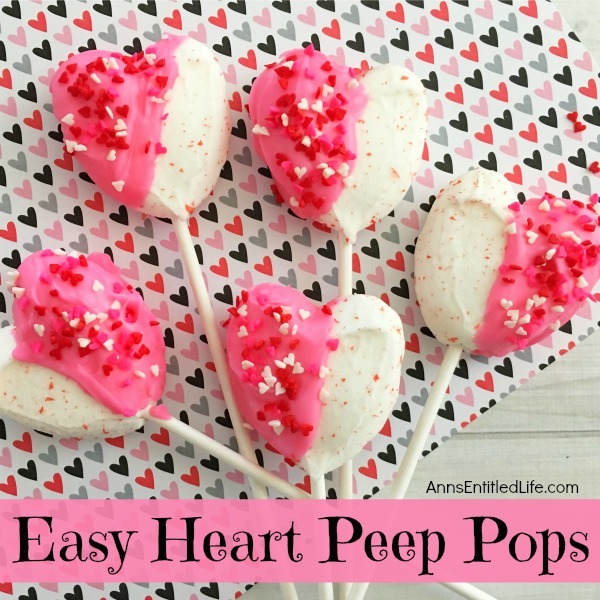 • Allow the candy coated heart peep pop to harden at room temperature for 15 minutes. There are so many ways to dress up Peeps, and this is quite a simple one. You could wrap these Peep pops in cellophane and give them out for Valentine’s Day too. Mmmmm Peeps! 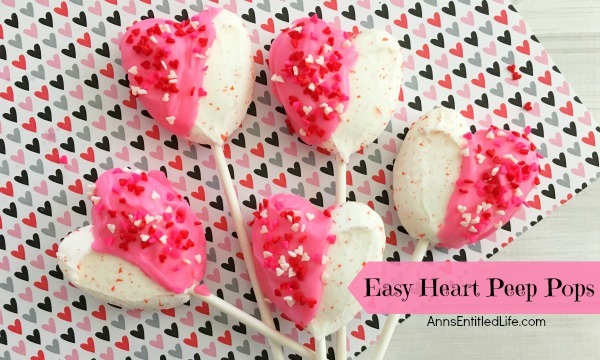 If you are looking for more easy Valentine’s Day recipes, you may want to try this Easy Heart Pretzel Recipe or these Lip Pops, or perhaps this simple Jello Hearts Recipe! • Makes 9 Easy Heart Peeps Pops. These are so cute. I bought a pack of these the other day and we didn’t care for the vanilla. I thought it was regular marshmallows. We LOVE marshmallows. So easy! Why haven’t I seen this before?!? 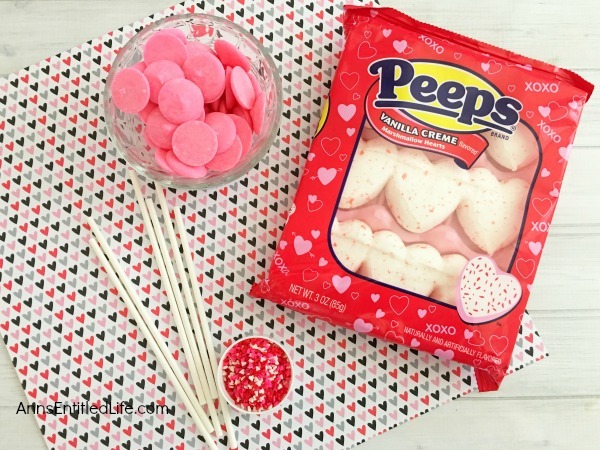 Completely making some Peep goodness this Valentine’s Day!